2010 Emmy Award predictions: Modern Family listed as Best Comedy Series: Competitors for the 2010 Emmy Award predictions include Glee, Nurse Jackie, 30 Rock, The Office and Curb Your Enthusiasm. Modern Family is a take on our everyday comically dysfunctional families. It takes reality to the next level. Hilariously witty and filled with all the challenges of raising children in a diverse environment: The newly remarried older man to a very attractive young Hispanic mother. The married gay couple trying to raise a baby Lily, and the married couple who remind me of the Cleavers from “Leave it to Beaver “only with today’s challenges of keeping their kids on the straight and narrow. Comical controversy is sparked at every corner of this show, keeping you in stitches. The 2010 Emmy Awards odds on this family winning are 5/7. Next up for the 2010 Emmy Awards is Glee. In the beginning the show appeared to be focused around Rachel Berry played by Lea Michele but as the story line has grown so has all its characters. Will Schuester, the loving glee club coach, teaches the students about compassion, good sportsmanship and fighting for what you believe. While he attempts to teach the children these standards, he is constantly being foiled and mocked by the hilariously funny high school gym coach Sue, played by none other than Jane Lynch. Her dry egotistical humor is one of a kind. The Glee odds are 4/1. The Office has its comical moments and is currently in the running for the 2010 Emmy Awards. Its lead character Michael Scott is constantly putting his foot in his mouth. And as for his employees, they are always on the move with some sort of plot or scheme against one another. I don’t believe this show has good enough ratings to take home the Emmy but the odds still put them in contention at 8/1. Nurse Jackie is your run of the mill comedy and is nominated for the 2010 Emmy Awards. A Nurse wrapped up in a whole lot of drama. She has a doctor with a nervous tic. She has a sidekick first year nurse who won’t get out of her hair and a pharmacist who seems to keep her coming back for more. The addiction to vicadin leaves the story a little flat to me as it appears to be copying the TV series House. I found this show to be mediocre in humor but not entirely boring. Their odds for The Best Comedy Series are15/1. Curb Your Enthusiasm is just buying time with its boring and out of date plot. The actor is old and his obnoxious neurosis are tiring leaving the 2010 Emmy Awards odds to win at 14/1. 30 Rock has its ups and downs and Jack Donaghy is up for best comedy actor, but as far as the numbers predict, this show’s chances of winning are 13/4. So there you have it folks. Times have changed and the 2010 Emmy Award predictions show the Modern Family taking home the award for Best Comedy Series. Join the 2010 Emmy Awards odds makers at the Las Vegas style online sportsbook BetUs.com. 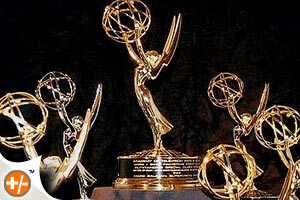 The Emmy odds makers at BetUS.com have posted Emmy odds on just about everything. make your 2010 Emmy Award predictions now!